There’s something intriguing, slightly mysterious even, about those brands you find only in bulk order places—or hotel rooms. Years ago as students we schlepped out to this cash and carry barn which sold large quantities at discount prices. Amongst our purchases was a huge tin of catering blend instant coffee. Back then ‘real coffee’ was for special occasions, take away was just taking off and the online marketplace a dot on the horizon. As for that tin of powdery catering blend, it sat on the shelf for months, slowly drying to a hard brown gravel. Coffee culture has come a long way since that share house instant experience. ‘Real coffee’ is now the norm—and not only in restaurants. In fact, ordering a cappuccino or a short black in a café is usually a safer bet than ordering tea. Café tea can be a hit or miss affair, anything and everything from fragrant loose leaves to a no brand tea bag with a cup of hot water. Which brings me to Pickwick. Pickwick is a brand I encounter in hotels. There it is next to the kettle—a selection of Pickwick tea bags: English Breakfast, Earl Grey, something green or herbal—alongside packets of sugar, sweeteners and stale biscuits. 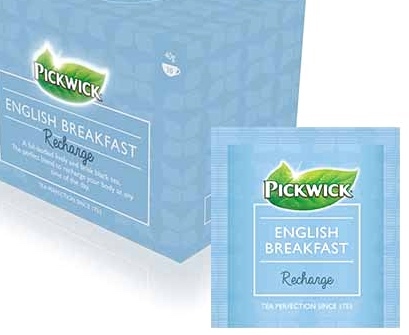 So I’ve come to equate Pickwick tea with catering blend tea. Although ‘catering blend’ is a label you don’t see so much these days. I’m sure it still exists but it’s probably called something less off-putting. ‘The monthly meetings of the Brick Lane Branch of the United Grand Junction Ebenezer Temperance Association were held in a large room … Previous to the commencement of business, the ladies sat upon forms, and drank tea, till such time as they considered it expedient to leave off … On this particular occasion the women drank tea to a most alarming extent.’ Charles Dickens: The Pickwick Papers. Pickwick is part of the Douwe Egberts’ empire. The Dutch company has been selling tea since 1753, but the name Pickwick didn’t appear on the scene until 1937. It was apparently chosen by the wife of the then director; she was a fan of The Pickwick Papers by Charles Dickens. No doubt the PR machine thought the name would conjure positive images of Victorian firesides and Merrie Olde England—which as Dickens so vividly showed, wasn’t so merry if you were poor. The Pickwick Papers was published in 1837. It’s the loosely related adventures of Samuel Pickwick, Esquire, as he travels through the English countryside with his companions. Dickens knew hunger, and his first novel revels in eating and drinking. Pigeon pie, broiled ham, oysters, cheese, hot buttered toast, wine, coffee—and tea. I remember discussing food in literature during a writing workshop. Food as metaphor, overcooked adjectives, whether recipes belong in fictional texts. The tea provided by the organiser was a catering brew rather than deluxe Assam but the conversation was rich and malty. Perhaps the hotel industry is Pickwick’s niche? Its target clientele? I’ve not seen it for sale in any of my local supermarkets or grocery stores. But you can order it from Officeworks, under Catering Supplies (Tea, Coffee & Beverages) at a bulk buy price. Which kind of proves my point. ‘”You’ll take some tea, Mr. Pickwick?” said the old lady, with irresistible sweetness. “Thank you, I would rather not,” replied that gentleman.’ Charles Dickens: The Pickwick Papers. Thank you for this lovely post! I absolutely love the Pickwick Rooibos and Vanilla but only ever get my hands on it if I’m at the right conference in the right hotel! Thanks for enlightening me – I’m off to Officeworks!